Making fun and festive trail mix is something we love to do with the kids. It's a great way to get them in the kitchen too! They get excited to sit down and think about which ingredients they could mix together to create a seasonal trail mix. When we asked them which ingredients they would use for spring, they instantly came up with bunny crackers and chocolate eggs. Everything else was just filling so we decided to throw in some pretzels and peanuts like any traditional mix would have. We thought about yogurt covered pretzels, but the yogurt covered raisins look similar to eggs and that fit the theme. 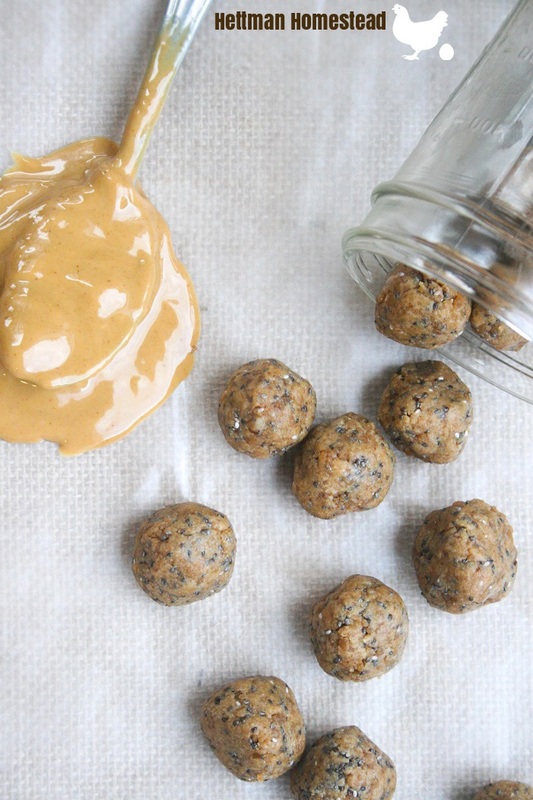 You can get creative with the ingredients or stick to the 5 simple snack foods in our recipe! Place all ingredients in a snack jar and gently mix until ingredients are evenly distributed. Is there a better season than fall? I'm convinced that fall is the only season I need in my life. Sweaters, squash, and everything good happens this time of year. Spring is pretty great too, but I would gladly trade summer or winter for a few more months of fall. Before I share the ingredients with you, I have to be honest here. I am not a big kale lover. We used to avoid it but I've learned a few tricks to make it more enjoyable. YES, kale can actually taste good and you don't have to chew the same bite for hours. Here are 3 tips to make your kale salad go from dull to delicious. Chop it up into small pieces and cut the ribs out of the leaves. Use a nut-based dressing (like I use in this recipe). I've learned that thicker vinaigrettes stick better while lighter vinaigrettes slide right off the leaves. Apply the dressing 30 minutes before you eat the salad. If you're really ambitious, you can even massage the dressing into the leaves. If you try that and you still don't like kale, try cooking it down a little first... If all else fails, add bacon. Preheat oven to 400. Cut the ends off the squash (so you have a flat surface and can stand it up). Slice the squash down the center lengthwise. Remove the seeds/pulp. Cut the squash into half inch thick halfmoons. Toss the squash pieces and 1/2 cup fresh cranberries in 2 TBSP olive oil. Place in a single layer on a large baking sheet. Sprinkle salt and pepper over the squash. Put in the oven for 20- 30 minutes or until the squash is tender and golden. While the squash is baking, begin the next steps. Wash the kale. Cut the ribs out of the leaves. Chop the leaves into small pieces and place in a large salad bowl. Set aside. Blend walnuts, maple syrup, apple cider vinegar, and garlic clove in a blender or food processor for 30 seconds- 1 minute. Stir olive oil, salt, and pepper in by hand until combined. Pour desired amount of dressing in the bowl of kale and toss together. I think it's better to go heavy on the dressing! Store leftover dressing in the refrigerator though you'll probably want to add more dressing once you add the other ingredients to the salad. At this point the squash should be finished baking. Remove from the oven and add the squash and cranberries to the kale salad. Crumble goat cheese into the salad bowl. Add 1/4 cup craisins If you didn't use fresh cranberries. Gently toss ingredients together. Stir in more dressing if desired. Henry wanted to make gingerbread cookies and Matilda wanted to make sugar cookies, so I came up with this! Both kids were happy and we ended up with a recipe that we will definitely make again. I'm not really sure what to name these? They are a cross between snicker doodles, gingerbread cookies, and sugar cookies... Spiced Sugar Doodles? Hmm.. I don't know about that! Luckily I'm more creative in the kitchen than I am with naming things! In a large bowl, cream butter, egg, molasses, vanilla extract and sugar together. In a medium bowl, mix flour, cinnamon, ginger, all spice, cloves, nutmeg, baking powder and salt together. Stir dry ingredients into wet ingredients. Do not over mix. Mix turbinado sugar and cinnamon together in a small bowl to make the sugar and spice coating. Scoop out one spoonful of dough at a time and lightly roll in the sugar and spice mixture. Place the dough balls on an ungreased cookie sheet. Put the cookies in the oven to bake for 12 minutes. After 12 minutes, remove cookies from the oven and put on a cooling rack. Sprinkle additional coarse sugar on top and let cool before eating. -Enjoy! We love risotto in this house and I've become a pro at making it. This butternut squash risotto is Brian's favorite (which is saying something because I make a pretty delicious mushroom risotto). Make this for a side dish, or bring it bring to a fall potluck or family gathering. It's simple and everyone loves it! Even our picky eater, Henry, will eat this! I'm thinking the orange color resembles mac and cheese so he approves! Cut the ends off the squash. Use a potato or vegetable peeler to peel off the skin. Cut the squash in half lengthwise, scoop out seeds and discard them. Slice the squash into 1/2 inch cubes. Place the squash cubes in a large baking dish and toss to coat with EVOO. Put in the oven and bake for 30 minutes. Continue the next steps while it bakes. Put butter in a large skillet over medium-low heat. Add chopped onions and minced garlic. Saute for 5 minutes or until onions are translucent and fragrant. Stir arborio rice into the onions and garlic for about 1 minute. Add one cup of chicken broth to the skillet. Once the liquid has mostly absorbed, add another cup of broth. Repeat this step until you've added 4 cups of broth. Add salt and pepper along the way. This step will take about 30 minutes. At this point most of the liquid should be absorbed into the rice and the squash should be fork-tender. Remove the squash from the oven and add to the ingredients in the skillet. Give the squash and rice a good stir. The squash will almost turn into a mash and make a nice creamy texture. This also adds a vibrant color! Lastly, stir the cheese and parsley into the risotto. Serve and enjoy! The holidays are approaching quickly and we are working on sharing as many healthy recipes as possible! This acorn squash would be a great Thanksgiving side dish or simply enjoy for dinner on a cold fall day. 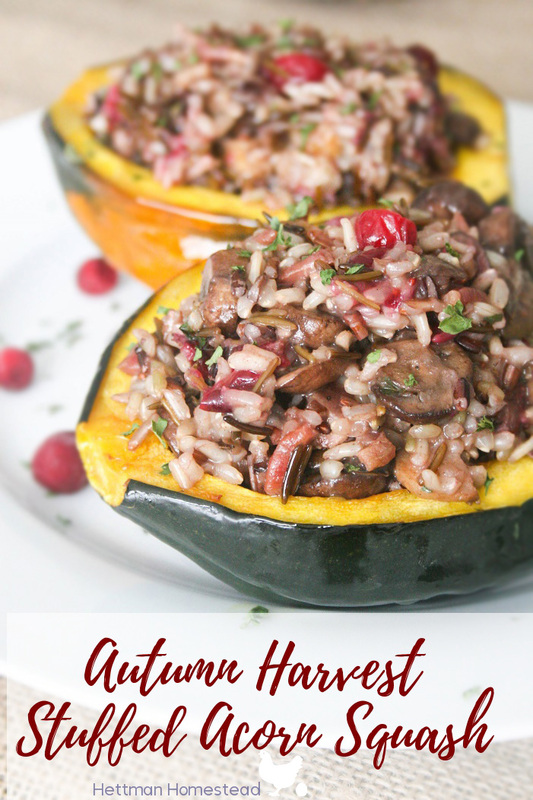 It brings out the best flavors of the season: fresh cranberries, pecans, and acorn squash. If you're making this for Thanksgiving, there are a few steps you can do the night before to save time. I would make the stuffing the day before and only bake the squash on Thanksgiving day. After the squash is cooked, add the stuffing and toss it back in the oven to reheat. This will save time as well as dishes! Bring chicken stock, bay leaf, celery salt, sage, thyme, mustard, and rice to a boil. Once the liquid is boiling, turn the heat to low and cover. Let cook for 40-45 minutes or until all the liquid has been absorbed and the rice is tender. Continue with the next steps while the rice cooks. Preheat the oven to 425. Cut the acorn squash in half lengthwise. Spoon out the seeds; discard. Lightly coat the squash in EVOO and place in a baking dish. Put in the oven and bake for 30-40 minutes or until the squash is golden and a fork easily inserts into the flesh of the squash (not through the skin side). Meanwhile, cook the bacon in a large skillet. Once the bacon is browned, remove from the skillet and place on a paper towel to absorb excess grease. Save the grease in the skillet for the next step. Add mushrooms and garlic to the greased skillet. Cook over medium heat for 3 minutes then add the cranberries and pecans. Cook for an additional 5- 8 minutes until the cranberries have popped and the mushrooms are tender. Remove from heat. At this point the rice and squash should be cooked. Remove the bay leaf and fluff the rice with a fork. Mix the ingredients from the skillet into the rice to make the stuffing for the squash. Stir in salt and pepper to taste. Remove the squash from the oven and scoop the stuffing into the squash cavities until full. You should be able to get 3 large serving spoonfuls of stuffing into each 1/2 of squash. As you can see in the photo below, the rice is sticky and packs together nicely. Sprinkle dried parsley flakes or fresh parsley over the top and serve immediately. Enjoy! Nothing gets me more excited to cook than fall weather. There's just something about the cold, crisp air that inspires me to make warm seasonal recipes. One of the tasks on our autumn family bucket list is to make festive trail mix, but I decided to make granola instead. Gingerbread sounded like a fun and festive flavor to try this year so we added spices and molasses to get the perfect flavor. 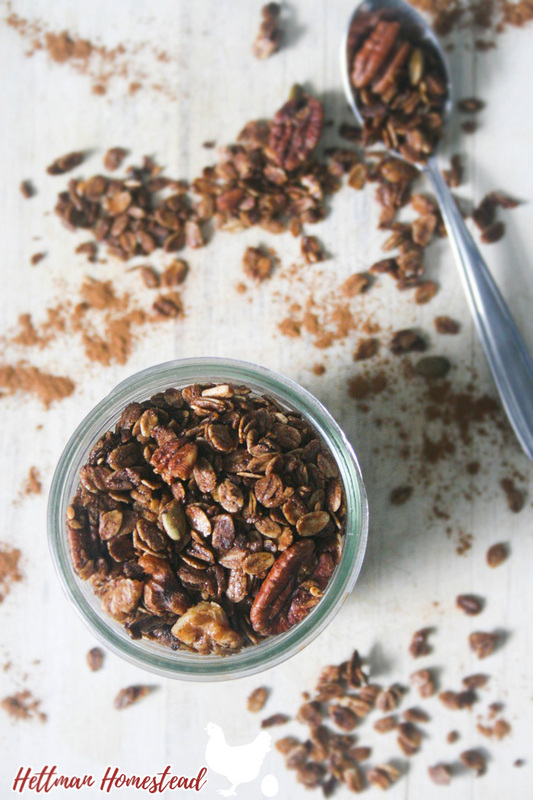 This granola is crunchy and perfect for many different recipes. I suggest adding it to greek yogurt with apples for breakfast or a snack. 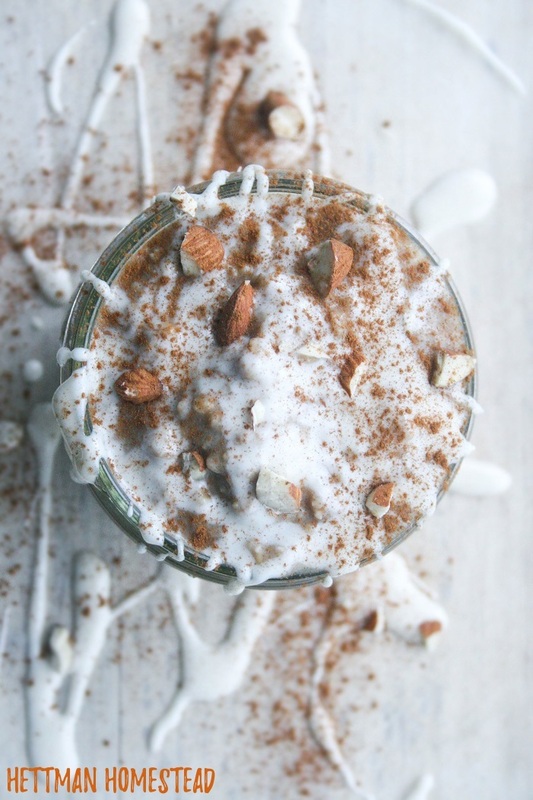 I added vanilla almond milk to this gingerbread granola for breakfast today and the kids loved it. I'm sure it would be a fantastic topping for ice cream too! Combine oats, cinnamon, ginger, allspice, nutmeg, cloves, brown sugar, nuts, and seeds into a large bowl, set aside. In a small pot, melt butter or coconut oil over low heat. Stir in maple syrup and molasses. Remove pot from the heat and stir in the salt and vanilla extract. Pour the maple syrup mixture into the bowl of the oat mixture and stir together until all the ingredients in the bowl are evenly coated. Pour onto a large sheet pan. Spread evenly around the pan. Bake for about 30 minutes, stirring every 10 minutes. When the granola is golden brown and has a crunch to it*, remove from the oven and let it cool before eating. *Stir every 10 minutes and try a bite to check for the perfect crunchy texture. Granola can burn easily without you knowing, so be sure to test every 10 minutes. 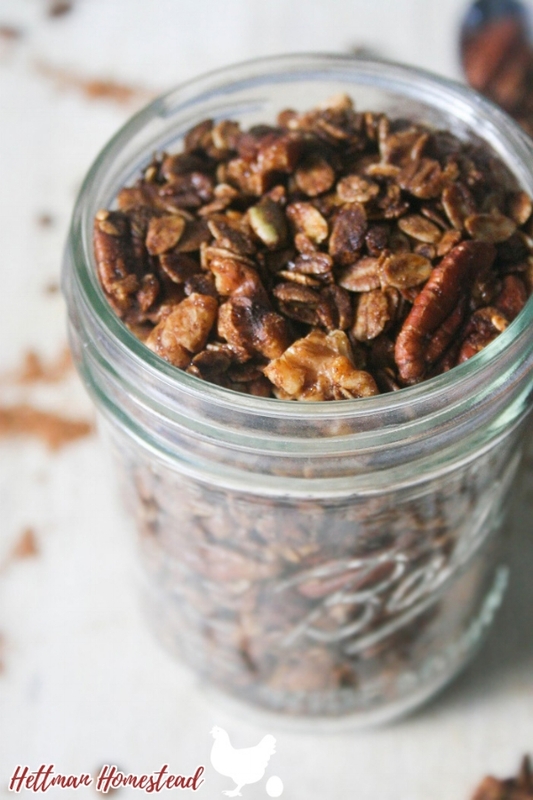 This granola should be golden brown and mostly crunchy when you remove it from the oven. It will be totally crunchy like any other granola after it cools completely. I had way too much fun making bunny shaped breakfast foods. I don't normally do stuff like this, because who has time for that? But, the cool thing about this recipe is that anyone can do it and it really only adds a few minutes to your prep/cooking time. Your kiddos will love it, you'll release the inner pinterest-mom that you always knew was there, and you get a healthy meal out of it. If you're feeling ultra festive, you can upgrade your already adorable bunny with a cheese bow. Cut two small circles (eyes) in each slice of cheese, then cut 6 strips (whiskers) in each of the remaining cheese slices. Cut the tip off 2 strawberries (nose) or use any piece of fruit. Set aside and begin the next step. Lightly grease a skillet and turn the heat to medium low. Crack the eggs into a medium bowl. Whisk eggs together until combined. Pour the beaten eggs into the preheated skillet. Cook the eggs, stirring every two minutes until scrambled and fluffy. Remove the eggs from the heat and divide the eggs evenly onto two plates. Cut each strip of bacon in half and nestle into the eggs to make the ears. Place the two circle cheeses on the eggs to make the eyes, then place one blueberry on each circle. Place the strawberry tip below the eyes in the middle. Make the whiskers by placing 3 strips of cheese on each side of the strawberry. Serve immediately and enjoy! Look for local pasture raised bacon with no added sugars. It's also important to buy bacon from pigs who have not been given growth stimulants, hormones, or antibiotics. Slice 4 strawberry rounds (nose) and 8 cheese rectangles (teeth). Set aside and begin next step. Once the pancake batter is smooth, stir in the milk then mix the protein powder into the batter. For each large pancake, pour 1/3 cup of the batter onto the lightly greased & preheated skillet. Cook until the top is bubbly- about 3 minutes. Flip the pancake and cook for an additional 2 minutes before removing from the skillet. Repeat until you have 4 large pancakes. For each of the small pancakes, pour 2 tablespoons of the remaining batter onto the skillet. Cook until the top is bubbly- about 3 minutes. Flip the pancake and cook for an additional 2 minutes before removing from the skillet. Repeat until you have 8 small pancakes. Cut each strip of bacon in half and place on a plate. Put one large pancake on top of the bacon leaving extra bacon at the top to make the ears. Add one teaspoon of greek yogurt for each eye on the large pancake, then place a blueberry on top of the yogurt. Place two mini pancakes on the bottom of the large pancake and add a strawberry round to the center for a nose. Use cheese or bacon to make whiskers and teeth. Serve immediately and enjoy! Healthy chocolate chip cookies? Yes please! These soft & fluffy cookies contain no refined sugar, egg, butter, or oil! Want to know what the secret ingredient is? Hint: the green behind the lean. Scroll down to get the recipe or download our latest e-cookbook for healthy baby and kid's foods! This book is a game changer and packed full of delicious recipes from breakfast all the way to dessert! Cut the avocado in half and discard the pit. Scoop out the avocado meat and place in a medium bowl. Pour vanilla extract and sugar into the bowl and mix with an electric mixer until smooth (no chunks of avocado remain). In a small bowl, mix the rest of the ingredients together. Stir the dry ingredients in the small bowl into the wet ingredients in the medium bowl. Place spoonfuls of the dough on a lightly greased cookie sheet. Bake for 12-15 minutes or until a toothpick inserted in the center of the cookies comes out clean.